In the era of interactive communication, consumers are asking for more from business news. They want more information from pictures and other multimedia contents. They are no longer satisfied with one-way-communication. They need personalized and interactive information. They not only need some standardized setups like online registration, sharing, voting and buying, but also need personalized elements like customized web pages and media players. 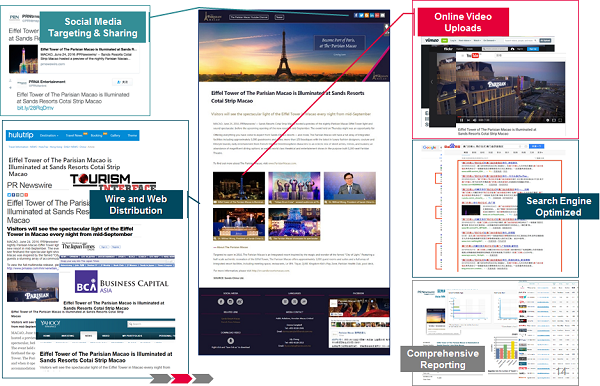 PR Newswire's Multimedia News Release enables corporate news to be distributed in an interactive and personalized way. APAC distribution reaches more than 4,500 media outlets and 15,000 journalists and editors. US distribution covers nationwide wire transmission to 5,000+ media, Digg, Google, Yahoo!, reddit and Newsvine. *Features can vary according to distribution circuits. Contact us for more information. If you are interested in our Multimedia News Release, please contact us via email or call the respective offices.